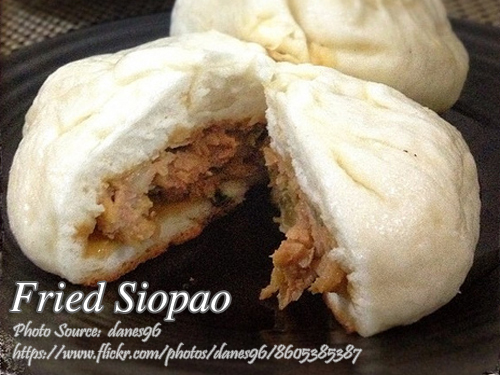 These white steamed buns with meat filling called siopao has evolved into a more creative kind of siopao. The toasted or baked siopao and the fried siopao. Before, I was a little confused about those two. I thought they are the same but when I made a little research, they are very different. The fried siopao is fried, not baked. Fried siopao is steamed first then fried using a greased skillet. It is not deep fried, just searing the bottom side until it becomes brown. It’s up to you if you want the top side fried too. On the other hand, toasted siopao is baked directly in the oven without steaming. So when it is cooked, the texture is similar to bread with meat fillings. It reminds me of an asado roll. To make the siopao dough; In a small bowl, mix yeast, sugar and water. Set aside for at least 5 minutes. Sift the flour in a mixing bowl. Then add yeast and evaporated milk then stir the mixture. Then add the softdrinks on the mixture while stirring. When mixture becomes stiff and formed into a dough, put some flour on the kneading board to prevent the dough from sticking. Press and fold the dough a few times to make it smooth. Then form it into a ball and put it in a large greased bowl. Cover it with a moist towel and let it rise for an hour. To see the rest of the recipe with the exact measurement of ingredients, continue reading. These white steamed buns with meat filling called siopao has evolved into a more creative kind of siopao. In a small bowl, mix yeast, sugar and water. Set aside for at least 5 minutes. Sift the flour in a mixing bowl. Then add yeast and evaporated milk then stir the mixture. Then add the softdrinks on the mixture while stirring. When mixture becomes stiff and formed into a dough, put some flour on the kneading board to prevent the dough from sticking. Press and fold the dough a few times to make it smooth. Then form it into a ball and put it in a large greased bowl. Cover it with a moist towel and let it rise for an hour. Combine all the ingredients in a mixing bowl (except salted eggs and chorizo). Mix until all the ingredients are in uniform consistency. Then take a 2 tablespoons and form into a ball. Do the same for the rest of the mixture. Take the risen dough and punch it. Fold and punch it again repeatedly. Then take some dough, depending on the size you want, but I suggest about 60 grams of dough if fine. Form the dough into a ball then flatten it with a rolling pin or you can use your hands. Fill the center with the filling, a piece of salted egg and a slice of chorizo. Wrap the filling (similar to wrapping a siomai filling with wanton wrapper) and seal the dough by twisting the top and shape into small balls. Place a piece of clean wax paper at the bottom of the balls to prevent them from sticking to the steamer. Let the balls rise for from 1 to 1-1/2 hours or until double in bulk. Steam the uncooked siopao for about 10 to 15 minutes. Before frying, remove the wax paper from the siopao. In a non-stick skillet, fry or sear the siopao for about 3 minutes until the bottom becomes brown. Add about ¼ cup water on the skillet and cover. Lower the heat and let it steam for four minutes more. 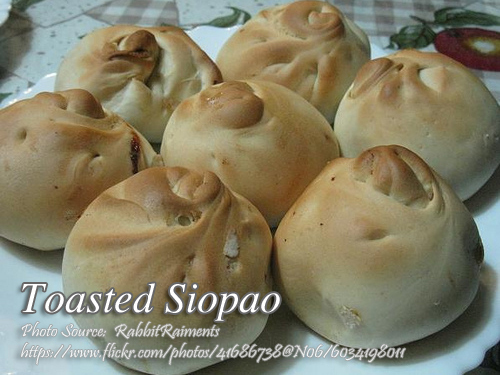 Place the uncooked siopao in a greased baking tray and bake it for about 30 to 40 minutes at 300 °F . Serve hot. Hi thanks po sa mga good recipes the you are posting , Ask ko lng po yuń sa toasted siopao filling after combining po ba yung ingredients will I still have to cook it or It will be cook pag nilagay ko na sya sa oven ? No need to cook the filling. It will be cooked when you bake the toasted siopao or when you steam and fry the fried siopao. thanks for sharing your recipes, you’re a big help to us who are trying to cook on our own efforts. May God bless you more. Hi Jade, thanks for the kind words! Hi kuya Manny, thanks a lot for sharing your wonderful recipes, I learned a lot from you. May I know po how many cups is 3/4 kilo all purpose flour? Hi Gloria, 3/4 kilo of flour is about 6 cups. Maraming salamat po sa sagot nyo. I wish you more success, Kuya Manny and God bless. Para san po yung softdrinks and bakit po mas preferred ang orange flavour? Hi Dana, I think it has something to do with the color when you cook the toasted siopao.